Commenced in 1849 to a design by Richard Pierce (1801-1854) and completed in 1859 St. Mary's RC Church was later extended and improved in the late nineteenth and early twentieth century. 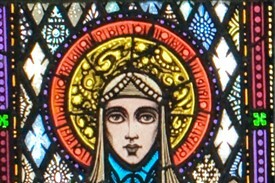 Renowned for the fine artistic importance of the D'Alton Windows supplied (1925) by Harry Clarke (1889-1931) of Dublin and the later West Window supplied (1930) by Harry Clarke Stained Glass Studios of Dublin to a design originally intended for Saint Peter's Catholic Church, Phibsboro, Dublin. This free event is open on a first come, first served basis but booking is recommended. Bring binoculars along if you have them!